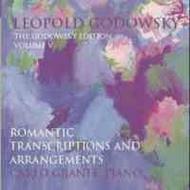 Carlo Grante has been recording the complete solo piano works of Godowsky for Music & Arts, of which this CD is the fifth volume. Of the fourth, containing the Chopin-Godowsky Etudes, Julian Haylock wrote in Classic FM Magazine "Anyone who has heard (or attempted to play) Chopin's original �tudes can hardly have failed to be blown away by their sheer technical effrontery and audacity. Imagine then what happens when someone creates a fresh series of �tudes from the same material-but increases the difficulty by a factor of three�Carlo Grante thrillingly captures the music's sense of danger." A lovely disc but it really does sound as though Grante has more than two hands!